iResQ, the Apple-authorized electronics repair company from the Kansas City area, has increased its environmental-friendliness by finalizing a comprehensive agreement with a local recycling facility. The agreement provides recycling for all its computer, cardboard, and paper waste. iResQ has announced a new partnership with a local recycling facility that specializes in redistributing surplus business goods to nonprofit organizations. Non-usable or otherwise poor electronics are sent to a reclaiming facility. The center counts surplus electronics, business machines, and computers among its tons of e-waste. iResQ's enhanced "green quotient" allows the company to continue its long-held tradition of recycling. Its existing cooperation with the Rechargeable Battery Recycling Corporation (RBRC) allows it to recycle the thousands of used batteries it receives each month. As a participant in the RBRC "Call2Recycle" program, iResQ separates used batteries from various devices and sends them off so that their primary components can be reclaimed to make new rechargeable batteries and stainless steel products. "We're excited to expand our recycling program to encompass all of our waste," says Brian Buffington, iResQ's general manager. "We hope to set an example for other companies in the technology field." Another way iResQ earns green credentials is by purchasing used, broken, or otherwise unwanted electronic devices from consumers. It refurbishes quality parts of unwanted iPhones, iPods and Apple computers to repair other iPhones, iPods and Apple computers. The rest of the unwanted parts are sent away to be reused or repurposed. More can be read about iResQ's commitment to purchasing used iPods, iPhones, Mac portables and desktops on the company's website, where owners can fill out forms to receive sales quotes for buying back used/broken electronics. 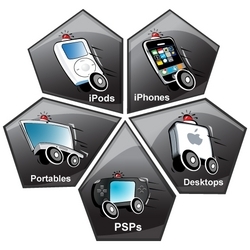 Centrally located in Olathe, Kansas, iResQ is an Apple-Authorized Service Provider that repairs Apple computers and portable devices in addition to the Sony PlayStation Portable. Servicing Apple products since 1994, its team of technicians boasts years of experience and multiple Apple Certifications. 24-hr. diagnostics and repair service cover the entire line of iPod, iPhone, Portable Mac, Mac Mini, and Apple TV systems. This includes the entire PowerBook G4 family, the iBook family, plus the MacBook and MacBook Pro systems, as well as all versions of the iPod except the iPod Shuffle. iResQ is also an ideal solution for schools and computer repair shops. Its repair depot can handle large numbers of repairs quickly and efficiently, and it provides volume discounts.